Casper Friedrich Wolff provided evidence supporting the epigenetic theory of generation—namely that, after conception, each individual begins as an undifferentiated mass in the egg and gradually differentiates and grows. Wolff’s theory (1759) was largely disregarded by the scientific community; however, during the following century, it was revisited and served as the foundation for the germ-layer theory. In 1815, the Estonian-born Karl Ernst von Baer attended the University of Würzburg, where he was introduced to the new field of embryology. His anatomy professor encouraged him to pursue research on chick embryo development but, unable to pay for the eggs or hiring an attendant to watch the incubators, he turned the project over to his more-affluent friend Christian Heinrich Pander, who identified three distinct regions in the chick embryo. Von Baer extended Pander’s findings in 1828 to show that in all vertebrate embryos, there are three concentric germ layers. In 1842, the Polish-German embryologist Robert Remak provided microscopic evidence for the existence of these layers and designated them by names still in use. The ectoderm or outermost layer develops into the skin and nerves; from the endoderm, the innermost layer, comes the digestive system and lungs; and between these layers, the mesoderm, is derived blood, heart, kidneys, gonads, bones, and connective tissues. It was subsequently determined that while all vertebrates exhibit bilateral symmetry and have three germ layers, animals that display radial symmetry (hydra and sea anemone) have two layers, while only the sponge has a single germ layer. Von Baer proposed other principles in embryology: General features of a large group of animals appear earlier than the specialized features seen in a smaller group. All vertebrates begin development with skin that differentiates to scales in fish and reptiles, feathers in birds, and hair and fur in mammals. In 1924, Hans Spemann’s discovery of embryonic induction explained how groups of cells form particular tissues and organs. SEE ALSO: Theories of Germination (1759), Embryonic Induction (1924), Induced Pluripotent Stem Cells (2006). 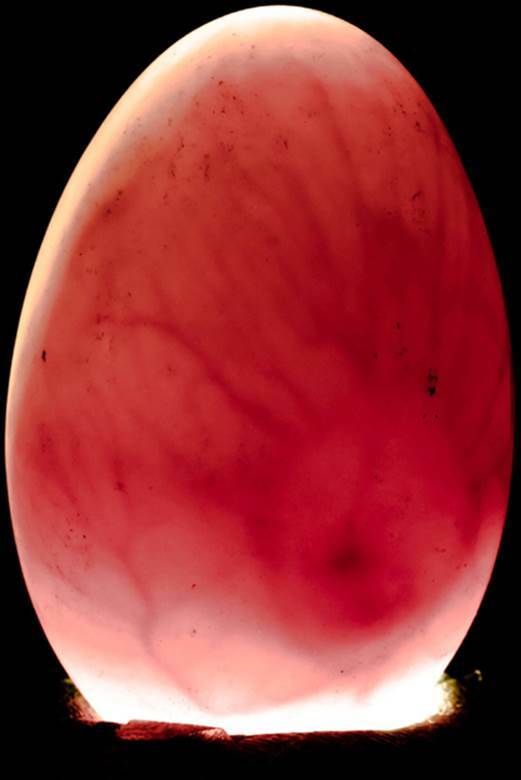 Eggs, such as this one-week-old chicken egg, are candled to observe the development of a chick or duck embryo and veins. Candling is performed in a darkened room with the egg perched on a light.